Welcome to my Spring home tour! 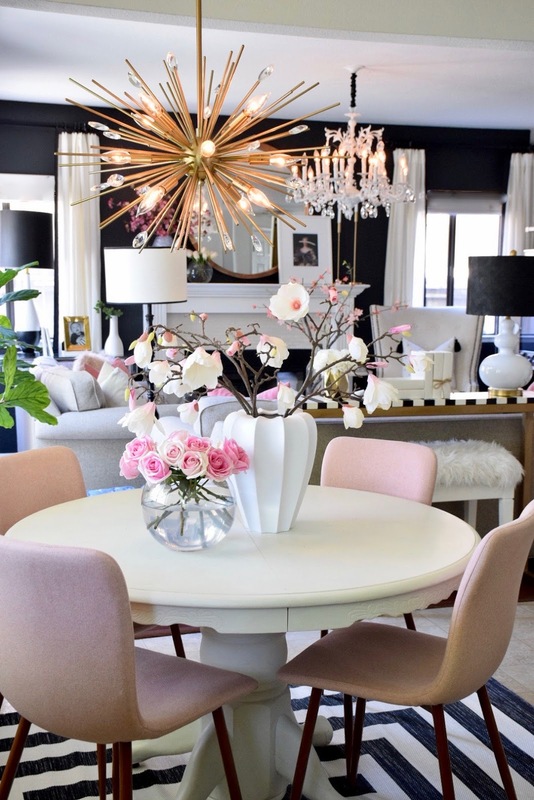 I'm so excited to be sharing this home tour with my colleagues and blogger friends at HomeGoods. At the end of this post i'll be sharing the names and links of everyone so you can be sure to check out their home tours as well! They're all spectacular! Another year down and here we are. First of all I wanted to say thank you to you all for your kindness and for being loyal followers. I love having you all still stop by my blog after all this time. Today i'll be showing you only parts of my home because some areas are a disaster as they are getting ready for projects that will be for other blog posts. For now my tour will be based in the living room where we spend time and watch tv, the dining room, the kitchen and the guest bathroom. It's the first home tour of the year and i'm super happy to be doing this as most of you know I started the year off on the wrong foot. I was extremely sick and i'm finally better and stabilized. This tour is probably my second favorite. After the holidays, you start packing everything back up that you used for parties and holiday decor and it's time to get your home organized for the new year. This tour is is when you get to sit and say "ahhhhh, it's time to relax and wait for Spring to pop up." I hope you enjoy my tour and don't forget to use the hashtag #gofinding on your social media outlets! In my home, I like to have flowers almost everywhere you look. I like to welcome spring by having a small get together with friends and having a good time. My tablescape for this was made with lots of flowers to represent the start of Spring while also giving off romantic vibes. 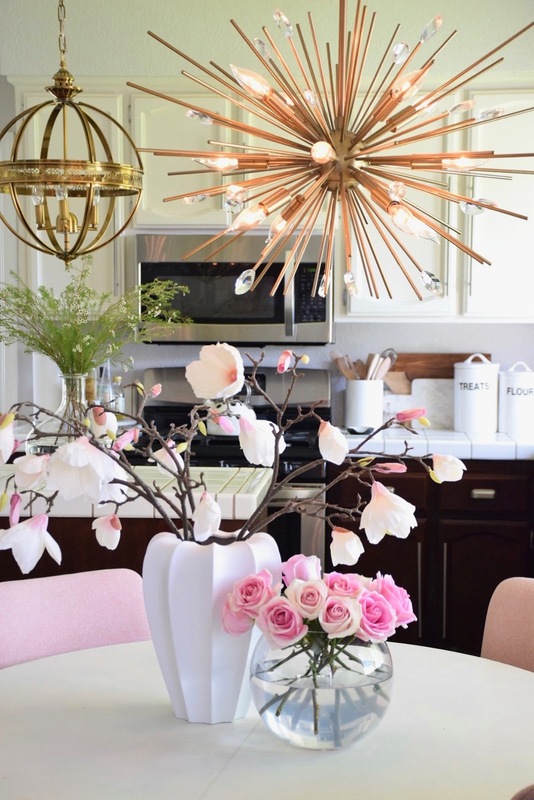 My kitchen has lots of light which is why I like to put flowers on the table with these vases. I think they make the flowers look even prettier. I love having plants in my home. I think it gives the room life and with these HomeGoods vases it's even better. It's something I just started doing as i'm not very good at tending to plants. It looks like it's working out for me this time and it gets me more excited for Spring. Not to mention they look beautiful in my kitchen. In my guest bathroom, I just simply added some flowers to liven up the room and to make it more Springy. Is that a word? LOL! Roses are my favorite! Make sure to visit our Spring Home Tours! I would buy throw pillows!! I think they're the easiest accessory to swap out every season! Liz, your house looks so good! 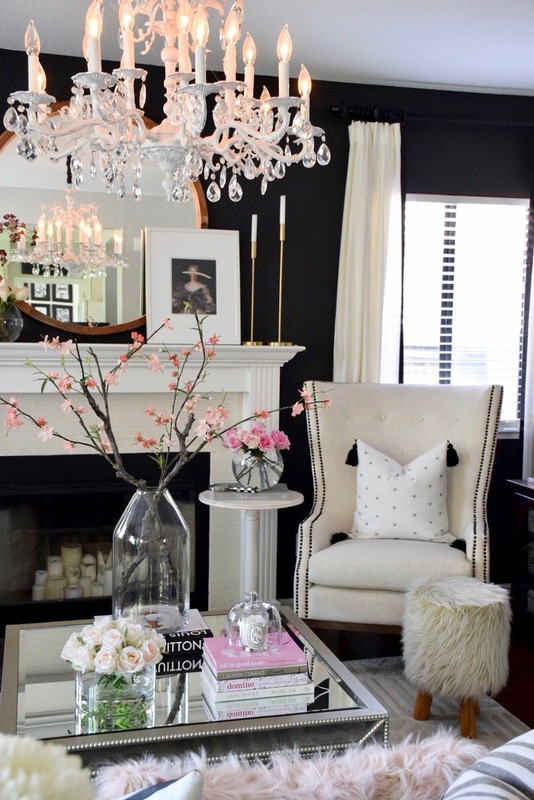 The touches of pink make it so cheerful and spring-y, and they go so well with your black, white and grey! 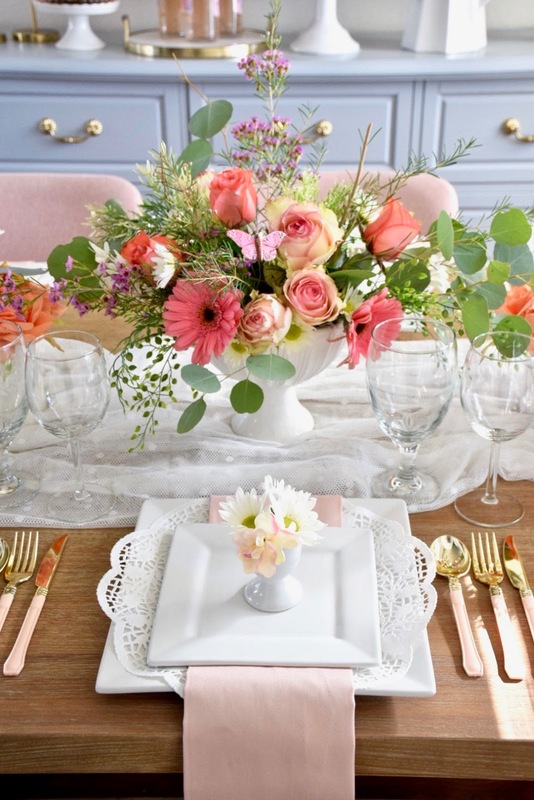 And your tablescape is gorgeous! The florals are truly beautiful. 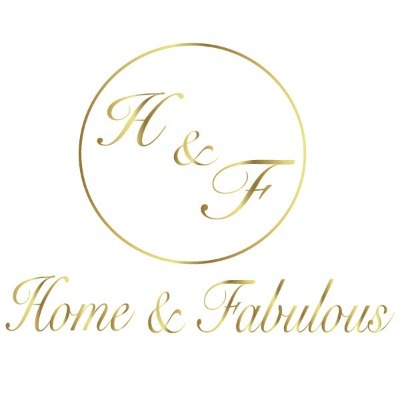 Thanks so much for hosting this fun giveaway - I'm a Home Goods addict and buy there every week so it's hard to say, but knowing me, I'd buy more fun dishes or napkins! 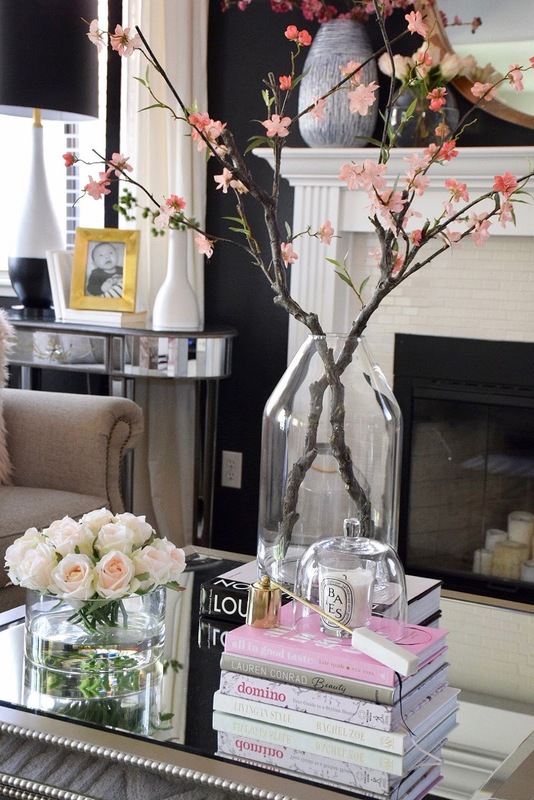 I would fill my living room silk flower arrangements! Love all the flowers but I have 3 kids under 4 so changing them out would be too much for me so I would buy the premade arrangements! Hi! I love love love your home! It’s absolutely beautiful!! I recently just bought a home too and funny thing is that I am also doing similar color schemes in my living room! 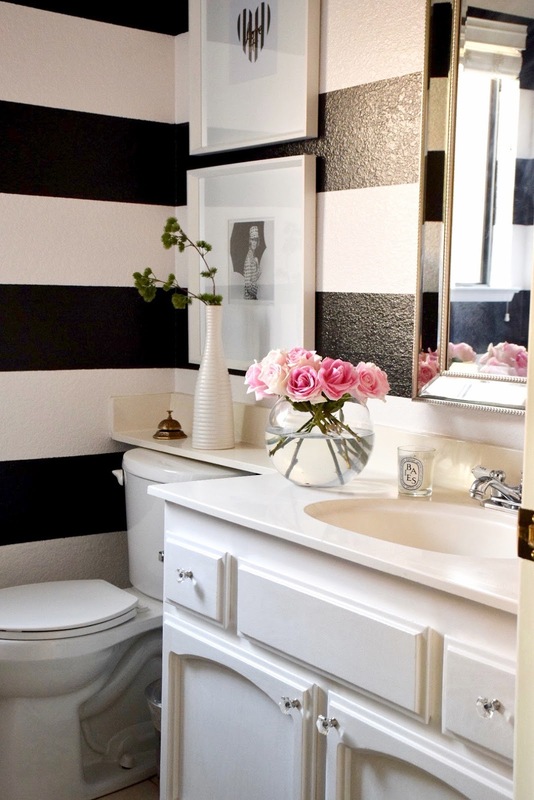 With the black and white stripes and blush pink accents! 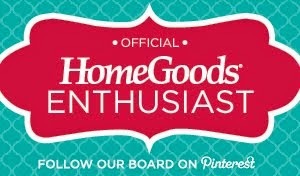 I love homegoods as well and most of my home stuff is from there!! With the gift card, I will buy more blush pink decor!!! I love pink flowers! I need to buy some pretty vases for them and place them around my home! wow, your home is amazing. i love the pops of color. homegoods is my fave place to find decor and pillows and curtains. such an easy way to change up a room! The roses in the guest bathroom are a nice touch! All of the flowers are beautiful. I love your dark walls in the living room. Not sure if I would be brave enough to go that dark. But they really set off the whole feeling of the room. What a dramatic and beautiful room. Thank you for sharing your gorgeous home. I love the fur accessories. I bought 2 fur pillows from HomeGoods for my living room, and they add such a feminine, warm touch. I’m blown away now by black, pink, and white. You design style is amazing! 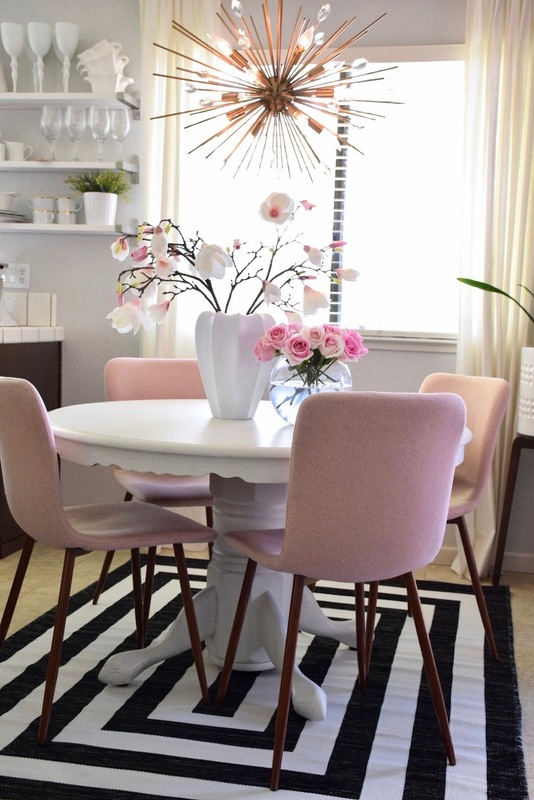 I would use a HomeGoods card for pink accents. I would fill my home with plants and silk flowers! Yours are gorgeous! Thank you for the chance to win! I would use the card for some new kitchen towels and decor! I’m would work on my coffee table decor!! You have several books stacked up that really tie in the colors of the room nicely. I need better structure on my table. Wow! Love your home! 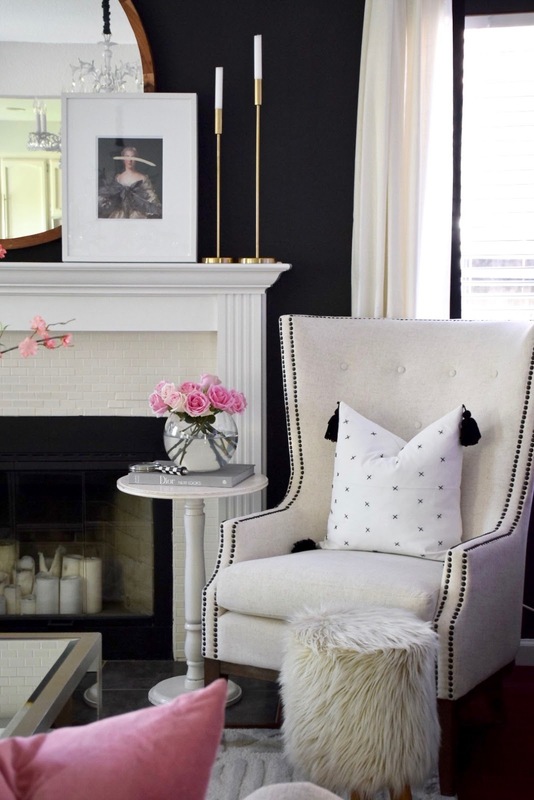 I adore a black and white there with a pop of pink! 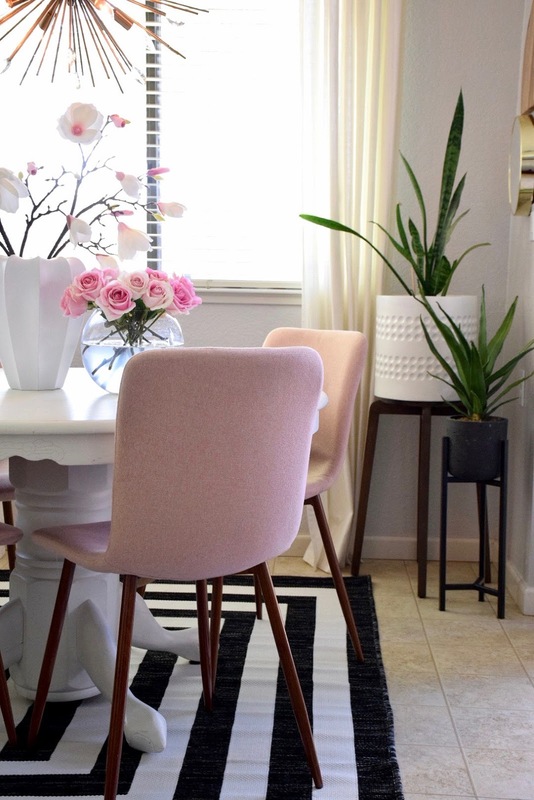 I'm inspired by your vases and beautiful flowers! I'd buy a new vase! Oh, I stop in to Home Goods every chance I get, so would love this gift. I likely would take home a pretty pillow. I would use it to buy wall decor for my daughter’s room! She also needs new bedding! Love Home Goods! Thanks for the giveaway! Gorgeous! I love your beautiful details. I would use the gift card to begin making my home more “springy” as well!! Thanks for the inspiration! I need to bring spring into our house. I have bookcases that would love to get some new decor on them! Thank you for the chance to win a gcard to spring-ify our house! What amazing décor! I love the Ralph Lauren satin sheets that I've found at Home Goods; always can use more of those. I love the pops of pink! It’s so pretty! This is my first visit to your blog and I'm in love! Your style is so elegant, but still cozy. Your home is just beautiful! Always love seeing how you decorate your home! If I won...I would probably buy some new Summer decor. I love your style, simply divine! My home needs an update and this gift card would be put to good use. If I won I would buy a new accent rug or decorative mirror for my house. Thanks for the chance! Funny, I was just there today and was admiring a set of botanical art prints. They sadly didn’t make the budget so I had to big them goodbye. I would definitely go back to hunt for them...or another piece of art if they’ve been kidnapped in the meantime. 😆 Your home is so lovely! 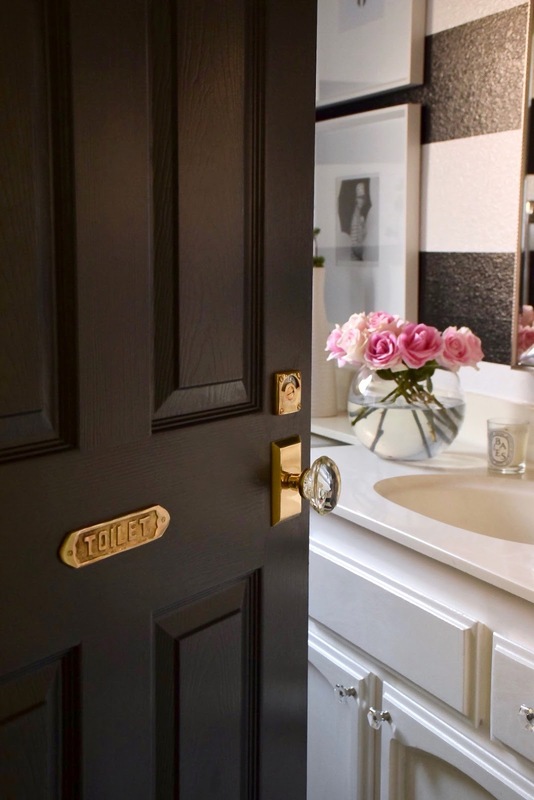 I’m partial to the color scheme...and that bathroom door! 🤗 Thanks for the inspiration & opportunity! I will be like a little girl in toys-r-us. There's a lot of stuff and hard to choose, probably I need more than one gc. Love your decor! There is so much to select from at HomeGoods but I think I'd buy some pink decor! It's my favorite color and I don't have any decor with pink. Thanks for the giveaway! What a lovely home! 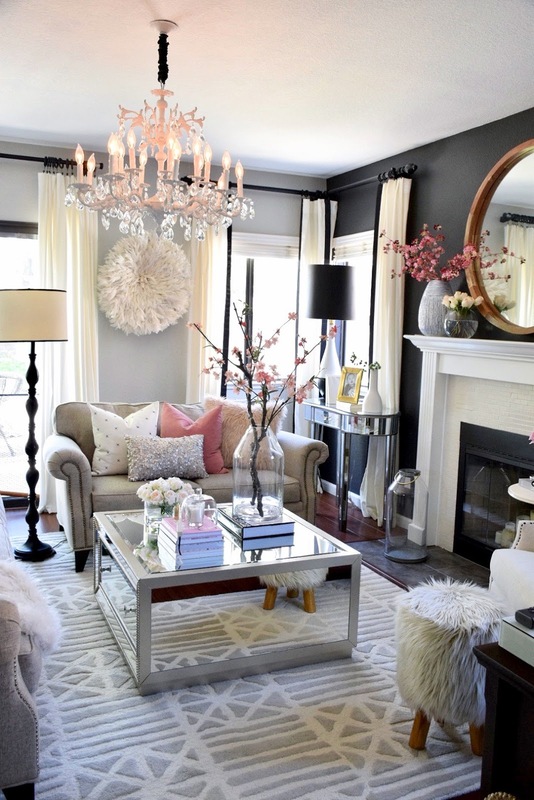 I am smitten with the large white chandelier.I love Home Goods, and I love all the blooms you've spread throughout. 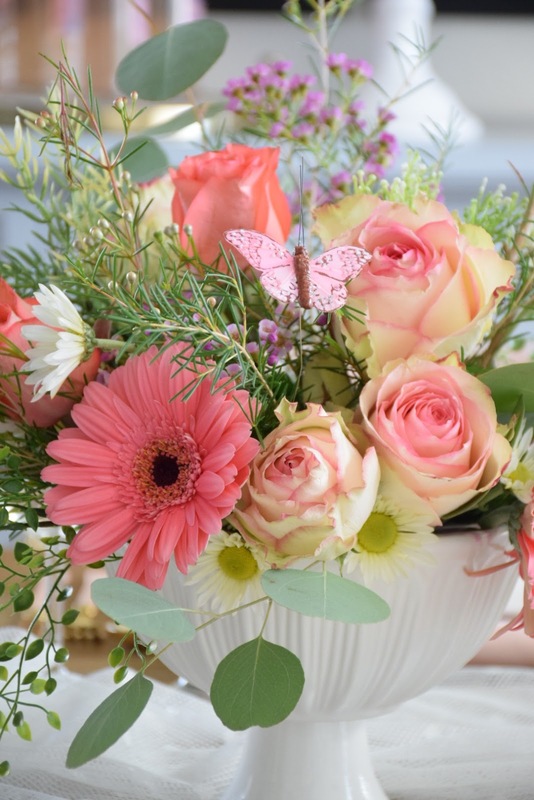 I especially adore that little butterfly in the arrangement!If I found that at Home Goods, I'd snap it up instantly. And I'm so glad to see more pink. This is my first time visiting your blog. What a lovely home you have! 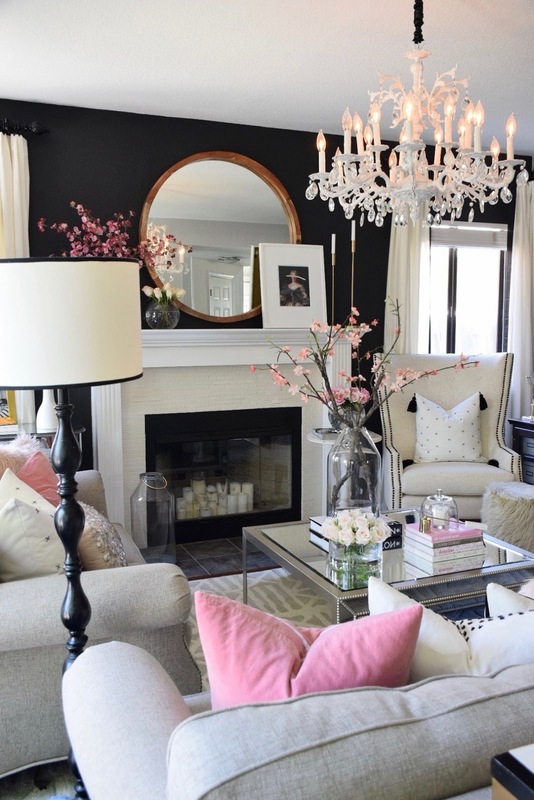 I adore pink and really like the dramatic black walls with pops of pink in your living room. If I won the giveaway, I would probably look for wood and copper pieces for my home. I love everything and would love to win this card! Home Goods just recently opened a store in our town. We went in a few days after they opened to look around. Whoa! The store was so STUFFED with "home goods" that I could barely get down the aisles. I couldn't get out of there fast enough. It was horrible and I haven't been back. But, I'd be willing to give it another try. Thanks for the giveaway! 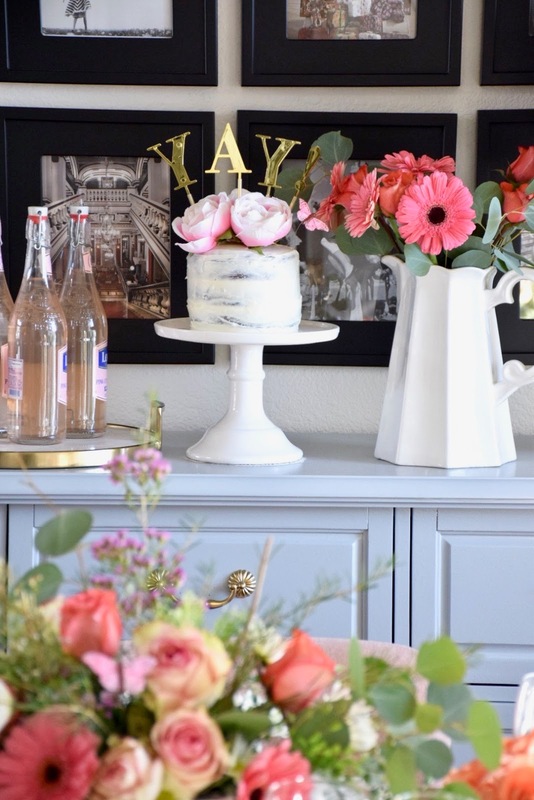 Your spring decor is beautiful! 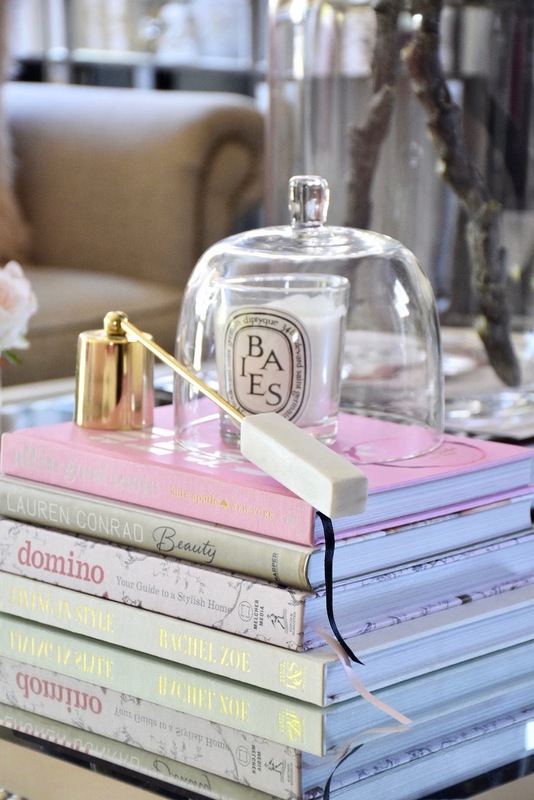 There are so many things to choose from when it comes to Home Goods but I'd probably get some Kate Spade table decor. 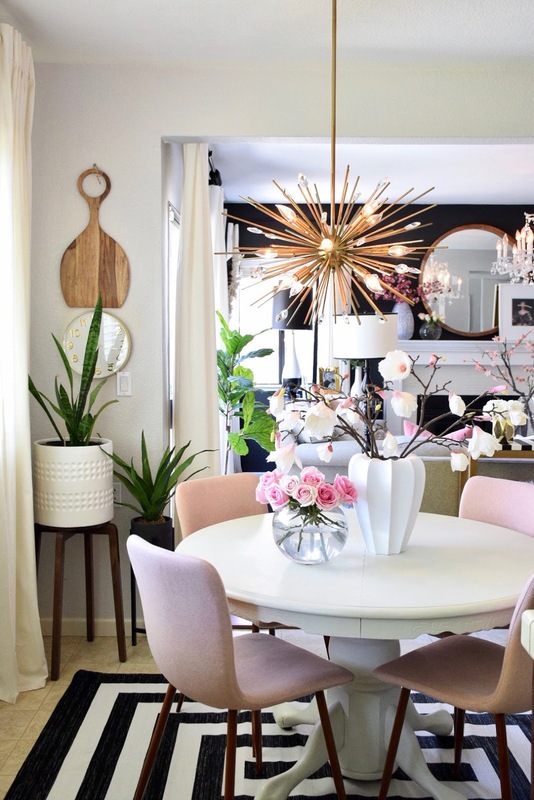 I’d definitely purchase more blush decor! Throw pillows, flower arrangements, you name it! Give me all the blush! 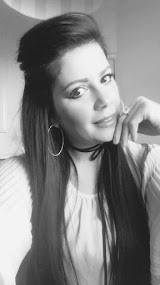 I follow you on Instagram for some time now, I love how beautiful and organize you have your home��I try to keep my like yours, but is impossible with a 2 year old��I was born and raised in Cuba and I had no idea of what HomeGood was until I came here in 2002, I still remember the first time I walked into one of the HomeGood stores in Miami��I want it to buy everything �� I can tell you that today almost everything inside my house is from HomeGoods! Such a beautiful home! I love the touches of blush you’ve added here and there. I would use the gift card for some dishes or maybe an urn planter. Hi l love your decor. I actually have your bathroom on my pin on Pinterest. I would use the gift card to style my bedroom. Beautiful home! I would use the gift card to decorate my master bedroom. It doesn’t feel welcoming and cozy. I need a new rug in my family room! I would buy a giant mirror similar to the one in your guest bathroom for my guest bathroom. We just remodeled our 1966 home from the ground up, so I can think of tons of things I’d love to buy at my favorite store on earth! 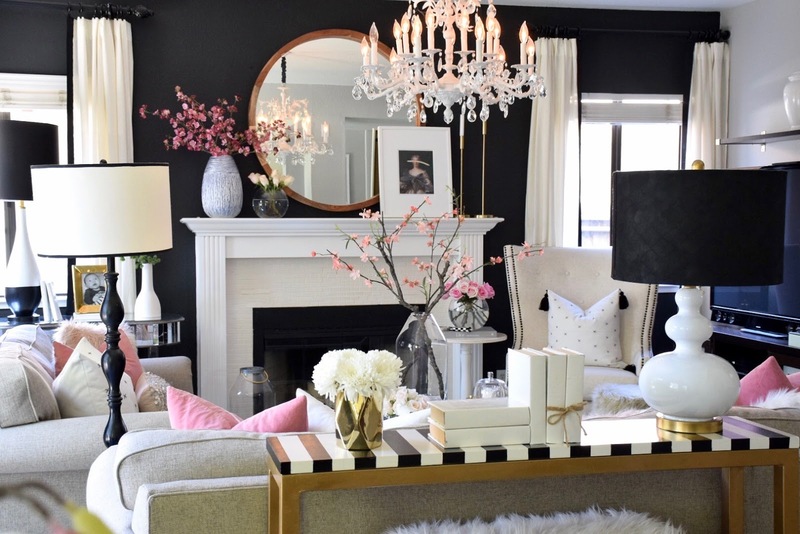 I just adore your home decor, so classy feminine and beautiful! If I win the homegoods gift card I would buy a piece of art to go over my couch.I still haven't found the perfect piece but I'm sure homegoods would have it. I would buy my daughter a housewarming gift for her new home. Anything from Homegoods is a winner! Visiting from Inspired Charm. Your home is stunning! Beautifully curated. 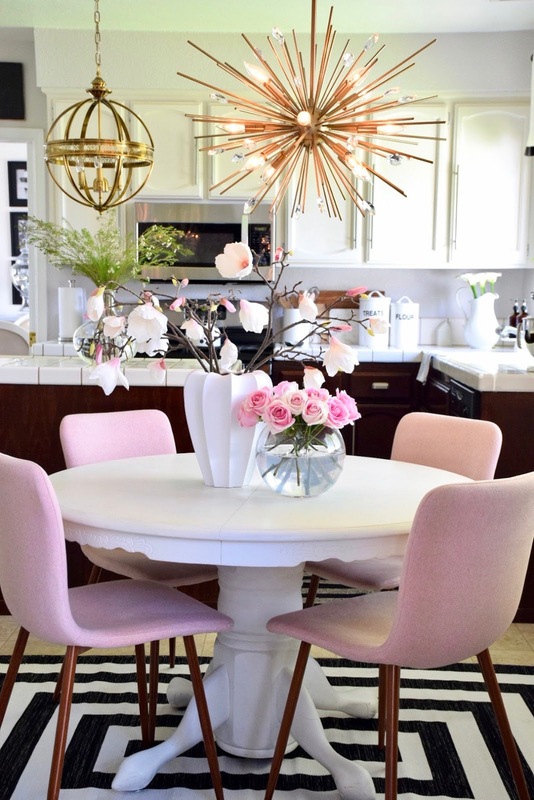 I'm smitten with those blush chairs. Thank you for sharing your home. Thanks for this opportunity! 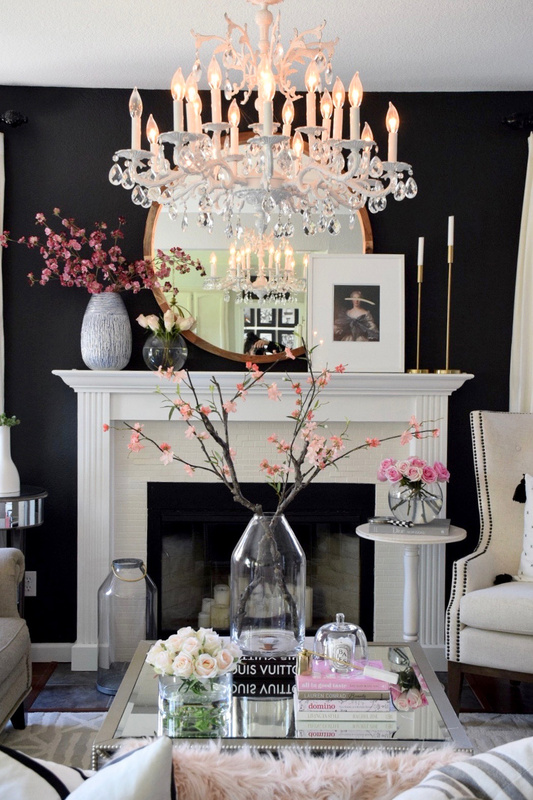 I’d love a little Spring refresh in my living room!!! Maybe even a new mirrored coffee table!!! Reviewing your article for inspiration! Your home is gorgeous. I would love to use a Homegoods gift card to add some springtime color to my home!! I just love Home Goods! My daughter is helping me refresh my home and we love to shop there. OMG! Your home is so lovely. 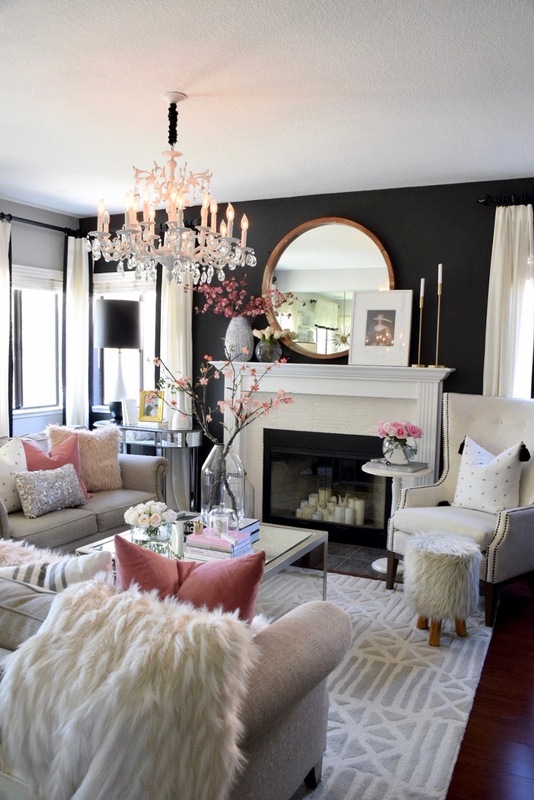 I especially love how you used contrast in your living room. 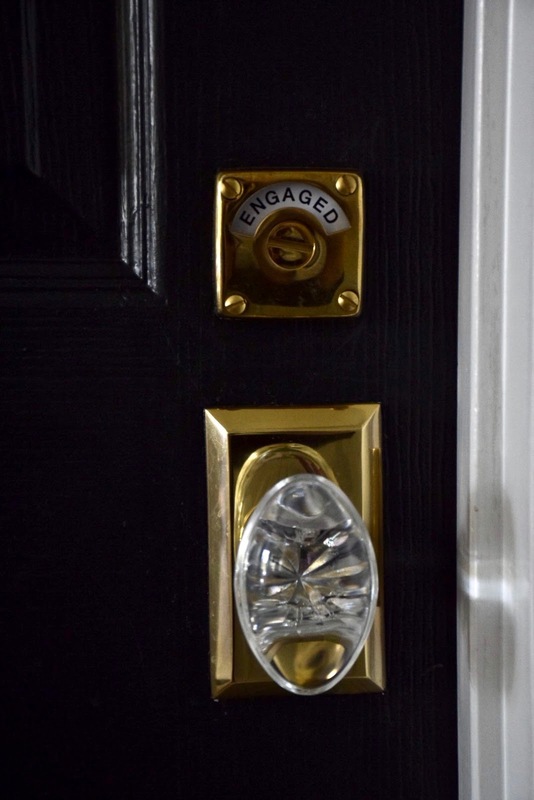 Can you please share where the "toilet" and "engaged" door signs for the bathroom are from? Thank you! I would buy pillows or baskets. I love texture - and HomeGoods, of course! I would buy a new doormat and spring wreath. I need new bedding for my guest room and Home Goods is a great place to start. Thanks for the chance to win! I love the layout of the living room and all of the organic elements in each room. The color palette is so simple but the pictures look so colorful and and cozy. I will definitely be using this as inspiration for my spring redecorating. I would love some new pillowcases for Spring. I would like to buy a storage bench from Home Goods if I win. I could use some new towels for my guest bath...but I'm easily distracted by all the pretties in Homegoods, there's no telling what I would end up buying! Thank you for the chance to win! A new bed and toys for the kitties would be fun. Your home is stunning! I’m currently updating my bedroom so if I won I’d use it on things for my bedroom. If I were to win the GC, I’d go crazy on the clearance rack making purchases to decorate my bedroom to make it more cozy! Thanks for the giveaway opportunity! I would get a blue floral rug to go in my living room to match our new sofa! I would also get some blue pillows to put on our new living room couch! I saw some beautiful turquoise melamine glasses that I'd love to get! I would get a couple new lawn chairs to go on our patio! This would be a shopping spree for my wife. Generally we try to only buy what we need, but if she had this, I think she would get the "wants". A new kitchen rug would be nice. Would also need a new bedroom setup! I could use some new artwork as well! Awesome! I would use the Home Goods gift card to help turn my blah-ish living room into something a bit more lively! Thanks! My bathrooms could also use some sprucing up as well! I’d love to change my colors altogether in both bathrooms. A Home Goods gift card could help with this! Thanks! Our master bedroom needs some major help too, a new lamp & other decor could do wonders for it! There are just so many choices at Home Goods! Thanks for the chance to win! Oh, it would be nice to get some items for my daughter's room. We are finishing the basement room for a big girl room. I would also like to get some room decorations for the middle child's room. She is moving out of the nursery to a big room of her own. Bedding & shelving is a must! I'm due in October and would love to stock up on baby things too. Homegoods have it all! I tend to limit flowers to the kitchen, dining room and bedrooms. Your beautiful home inspired me to bring them into more rooms - even my office. They just make me feel good, especially after a long winter. I would use the gift card for new lamps to freshen up our living room. I LOVE the pink and your dark wall (black?? )- such a great combo! We just added a pool to our backyard so I'd probably use a Homegoods card to jazz up our outdoor living space! 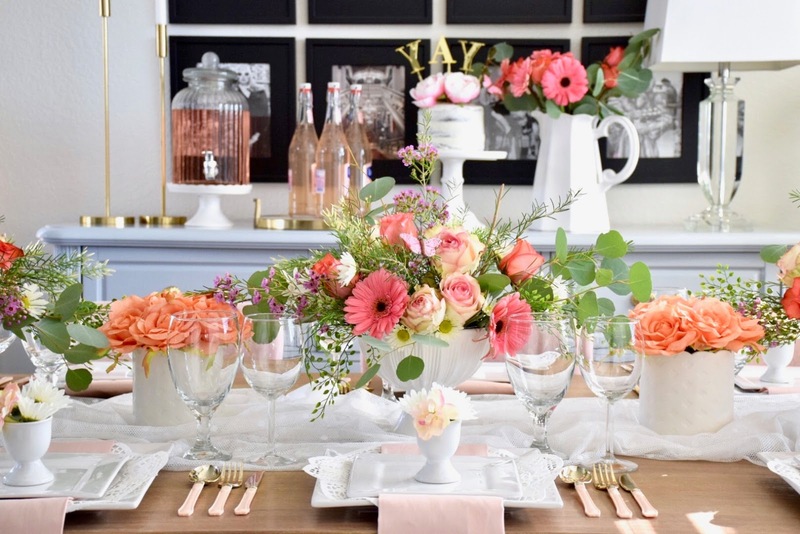 also love the floral arrangement used on the dining room table! so very pretty! There are 100 things I could spend this gift card on. Haha! I love your addition of roses to each room. So pretty! I could name so many items I would want to purchase with the gift card! Home Goods is one of my favorite stores! Such gorgeous items! Best part about Home Goods is that it’s not going to cost an arm and a leg like similar stores! I SO LOVE YOUR DARK WALLS! MY WALLS ARE HEMATITE AND I JUST LOVE IT. IT MAKES ME FEEL HUGGED AND COZY. IF I WON THE GIFT CERTIFICATE I THINK I WOULD STRIPE MY LONG HALL LIKE YOU DID IN THE BATHROOM, I HAVE ART WORK FROM CEILING TO FLOOR AND I THINK THE BLACK AND WHITE STRIPE WOULD LOOK REALLY COOL. Thanks for the chance to win! I love homegoods! I am making my shopping list to homegoods- fingers crossed that I would win! I love your roses. 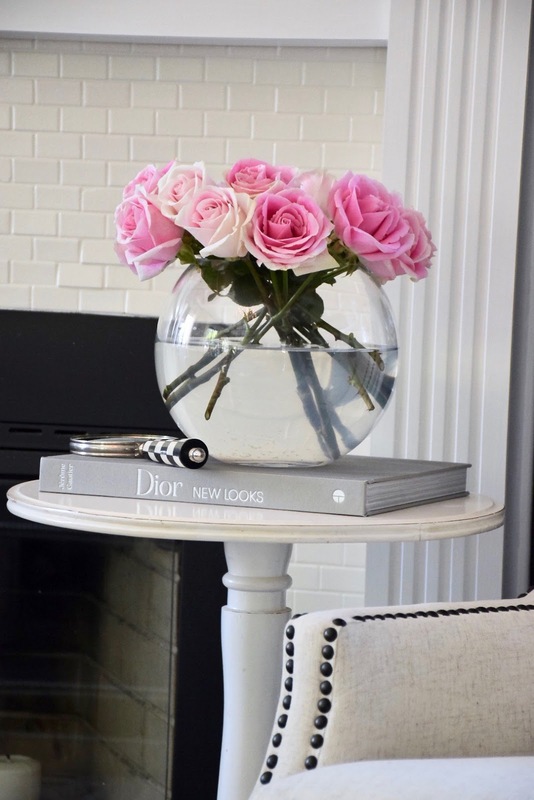 I plan on finding orb type vases to copy your style. Thanks for the inspiration! We need new spring bedding. I have my eye on some Ralph Lauren blankets at Homegoods. I love your bathroom doorknob. Very classy! Your house is very cozy. A lamp or a chair is also on my wishlist. Your home is beautiful to say the least, I am inspired to find pillows for my wing chair pair I purchased at Homewood's because I think that is what is missing, couldn't decide if I should have two of the same in the living room. I would buy a coffee table to decorate with books etc. using your photos as my guide. Blessings from above over you and your loves ones. We have a new Home Goods Store. I've still not been there, but I will have to remedy that soon! That chandelier in the living room is so cool. I really like it a lot! 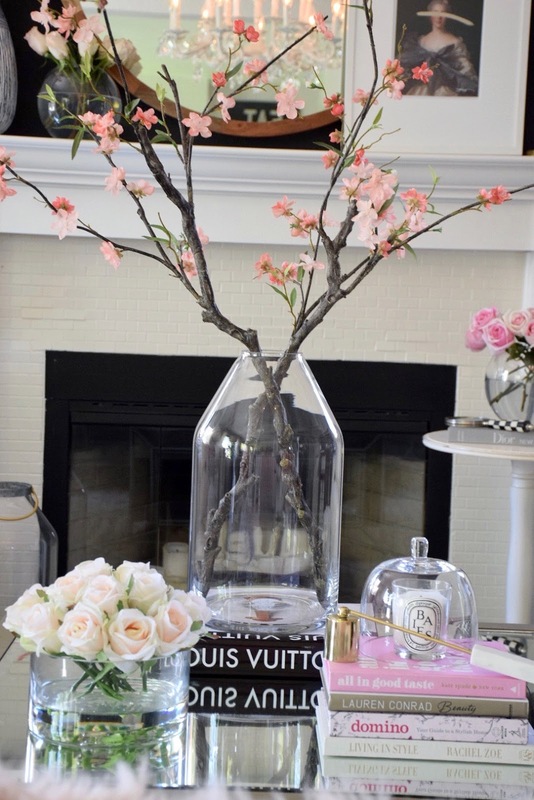 I love all the vases with the pink flowers. They are so pretty. I love flowers! The "engaged" sign on the bathroom is pretty nifty! I like it! 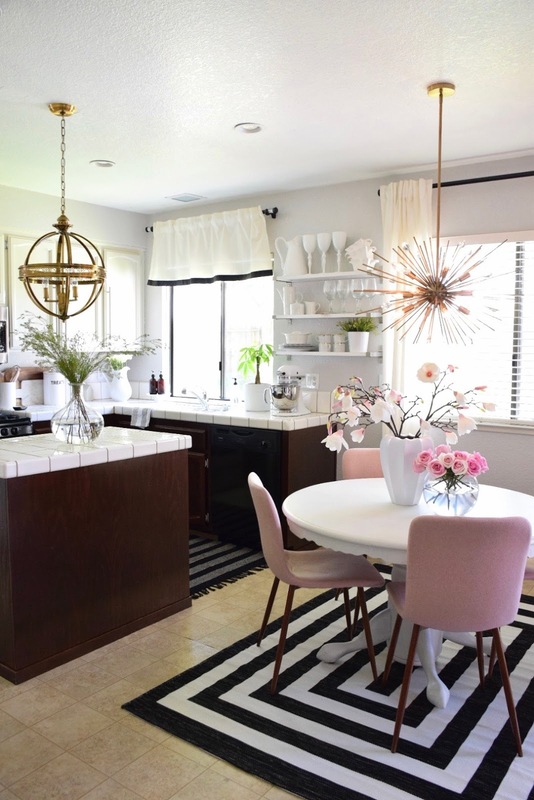 The pink chairs in the kitchen are so pretty. Pink is one of my favorite colors, too. I love how you used the white serving pitcher for flowers. So cute! I am absolutely in love with your home! I hope to one day have a place like this. If I won the HomeGoods gift card I would use it to welcome my baby boy. I'm having my first son and I need several things for his room still. I would use the gift card to buy baby bedding for the crib. I would buy baby bottles from HomeGoods as I don't have any right now and the baby should be here soon. I am a single mom so I don't have any extra money to spare right now. Any extra help I could get would be amazing. I could also use the gift card to buy the baby clothes at TJ Maxx or Marshalls. As mentioned, I still need a lot of things for the baby and this would be sooo helpful!! 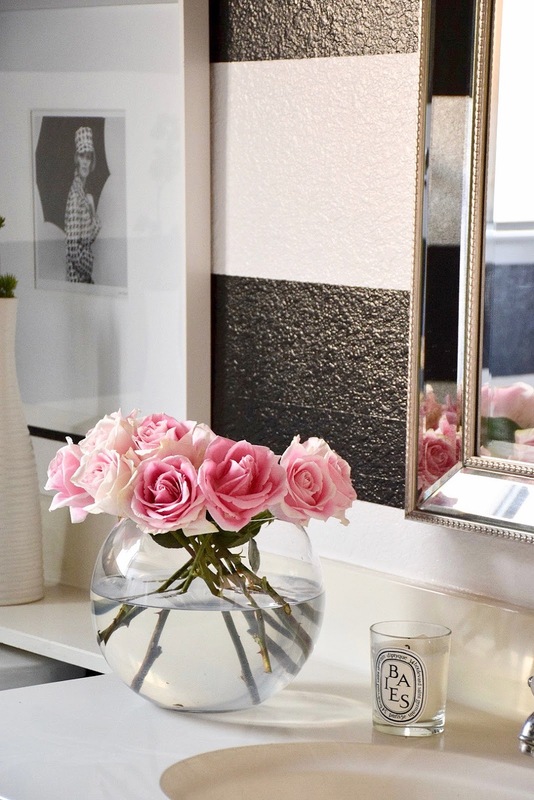 I would love to get some new items to update our bathroom -- as well as some pretty mirrors for throughout the house. I also need throw pillows for both the bedrooms and living room. Hope I win! I hope I win! There are SOOOOO many things I want/need for our house. This would sure help! I wish my house looked half as beautiful as yours! I can visualize so many of these things in our house, though! Wow! Your home is AMAZING! I would love to find a rug or a fiddle leaf fig tree with the giftcard! I'd love to get a runner rug for our front hall! Yaaaass! The bathroom is everything. Do I need it? No. Do I have to have it? YES! 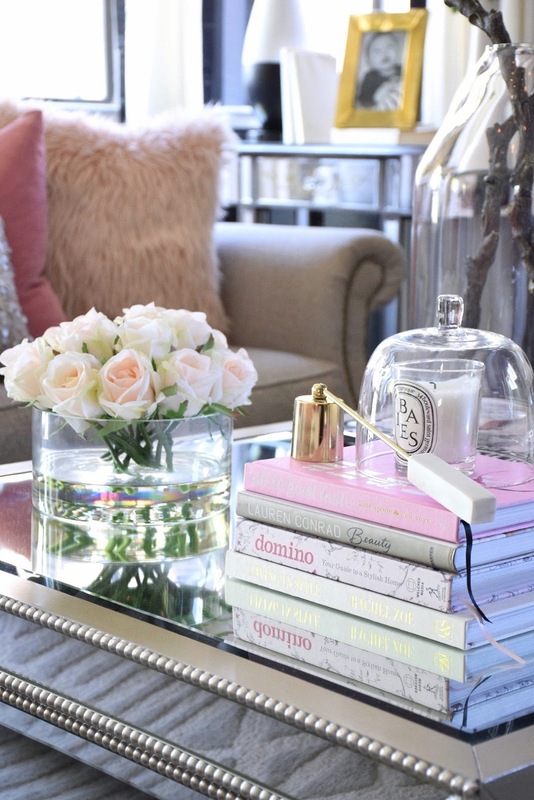 I’m pretty sure I need the mirrored coffee table... and everything else! Love everything about your home! I haven't gotten to go to a Home Goods store yet but this would be the perfect time to get to go! Thanks for the opportunity to win! I absolutely LOVE this space! Great post! Beautiful Home!! Great use of flowers & all home decor. It's look so colorful and lovely!! Wonderfully done! Thanks for sharing. This is so beautiful!! The way it all works together is perfection. What brand/color paint did you use on the black wall? Do you do interior design consulting? If I won the gift card, I would donate it to my Class Reunion as a raffle gift. I’m on the committee and when we make a profit from our annual reunion, we donate the profit to the student body at our high school. Love all the beautiful flowers in your house!